BERKELEY - Few would guess that the military has been an integral part of UC Berkeley's history since the university's birth. In fact, military training was compulsory here from 1870 to 1962. The University of California came into being in 1868 as a merger between the cash-strapped College of California (a private institution incorporated in 1855) and the Agricultural, Mining, and Mechanical Arts College (a public institution formed in 1866). The latter was created by the state legislature after it took advantage of the federal Morrill Land Grant Act of 1862, which offered states a grant of public land if they would establish a public college teaching agriculture, mechanical arts, and military tactics. And thus the precursor to the army's Reserve Officer Training Corps was born. In exchange for California's share of 150,000 acres, the first male undergraduates at the new University of California were required to serve two hours per week for four years being trained in tactics, dismounted drill, marksmanship, camp duty, military engineering, and fortifications. North Hall, which no longer exists, housed an armory. The university president's report from 1902 states that "The University Cadets from last year numbered no less than 866. Appointments as second lieutenants in the regular army have been conferred upon several men who have distinguished themselves as officers in the University Cadets. It is very much to be hoped that the War Department will establish permanently the policy of offering such appointments to the graduates of each year who show the highest ability in military pursuits." In 1904, the service requirement was dropped to two years, and in 1917, Cal's ROTC was established more or less as it exists today. During World War II, the military beefed up its presence on campus to churn out recruits from the officer training corps. The army program took over Bowles Hall, a dormitory, and the naval program took over the International House and several fraternities for its trainees. By 1944, more than 1,000 navy personnel were studying at Cal, roughly one out of every four male Berkeley students. With the end of the war and then the later rise of student activism, the California Board of Regents succumbed to pressure from the student government and ended compulsory military training at Berkeley in 1962. Former secretary of defense Robert McNamara and former Army chief of staff Frederick Weyand are both graduates of Cal's ROTC program. 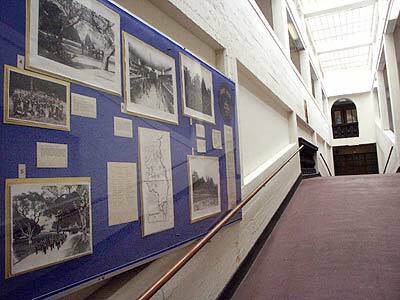 To learn more about ROTC's history at UC Berkeley, visit Hearst Gymnasium's first-floor exhibits, which showcase historical photographs and memorabilia — including ship's wheels and antique machine guns. Back to "Berkeley and the ROTC: Enrollment is climbing, and student attitudes are shifting"